Plastics have become an indispensable part of our technological society. The term plastic is applied to a wide range of synthetic and semi-synthetic products, and a few naturally occurring materials as well. The name plastic is derived from the fact that many of these materials have the property of plasticity—that is, they can be shaped in different forms, including various boards, films, and fibers. Given their adaptability, general uniformity of composition, and lightweight, plastics are being used for numerous products, including those used in homes, schools, offices, factories, recreational facilities, and means of transportation and communication. Plastics have become an indispensable part of our modern technological society. Yet plastics are also associated with certain environmental problems, such as the release of chemical pollutants during manufacture or incineration, and the problem of plastic litter that is not biodegradable. To help solve these problems, plastic recycling programs have been instituted in many countries. Plastics fall in a larger category of materials known as polymers. Molecules of a polymer consist of long chains made by the linking of small building blocks called monomers. The main "path" along which the monomer units are linked together is called the backbone of each polymer chain. The chains are often cross-linked with one another, and the material may contain other substances to improve performance or reduce cost. The vast majority of plastics are composed of polymers in which the backbone is made of carbon atoms, with or without oxygen, nitrogen, chlorine, or sulfur atoms. Some plastics of commercial interest have a backbone of silicon. To customize the properties of a plastic, chemists may add molecular groups that "hang" from the backbone of each polymer chain. Using such approaches, plastics can be designed with immense variation in properties such as heat tolerance, hardness, and resiliency. This ability to customize the properties of plastics has enormously expanded their usefulness. Plastics can be classified in many ways. Most commonly, they are named after their polymer backbone, such as polyvinyl chloride, polyethylene, acrylic, silicone, and urethane. Other classification systems include thermoplastic versus thermoset, elastomers, and engineering plastics. The development of plastics can be traced from the use of natural materials such as shellac to the use of chemically modified natural materials, such as natural rubber and nitrocellulose, and finally to artificially synthesized products, including epoxy, polyvinyl chloride, and polyethylene. People have been using natural organic polymers for centuries, in the form of waxes and shellacs. A plant polymer named "cellulose" provides the structural strength for natural fibers and ropes, and by the early nineteenth century, natural rubber, tapped from rubber trees, was in widespread use. Eventually, inventors learned to improve the properties of natural polymers. Natural rubber was sensitive to temperature, becoming sticky and smelly in hot weather and brittle in cold weather. In 1834, two inventors—Friedrich Ludersdorf of Germany and Nathaniel Hayward of the United States—independently discovered that adding sulfur to raw rubber helps prevent the material from becoming sticky. In 1839, American inventor Charles Goodyear was experimenting with the sulfur treatment of natural rubber when, according to legend, he dropped a piece of sulfur-treated rubber on a stove. The rubber seemed to have improved properties. Following up with further experiments, Goodyear developed a process known as "vulcanization," involving cooking the rubber with sulfur. Compared to untreated natural rubber, Goodyear's "vulcanized rubber" was stronger, more resistant to abrasion, more elastic, less sensitive to temperature variations, impermeable to gases, and highly resistant to chemicals and electric current. Vulcanization remains an important industrial process for the manufacture of rubber in both natural and artificial forms. Natural rubber is composed of an organic polymer named isoprene. Vulcanization creates sulfur bonds that link separate isoprene polymers together, improving the material's structural integrity and other properties. By the early twentieth century, other natural polymers were extracted and used in specialty applications. Zein protein, derived from corn, was widely used to provide water and grease-resistant coatings. In discovering the vulcanization process, Goodyear had improved the properties of a natural polymer. The next logical step was to use a natural polymer, cellulose, as the basis for a new material. Inventors were particularly interested in developing synthetic substitutes for natural materials that were expensive and in short supply, because they could then exploit a profitable market. Ivory was a particularly attractive target for a synthetic replacement. Alexander Parkes, an Englishman from Birmingham, developed a synthetic ivory substitute named "pyroxlin," which he marketed under the trade name Parkesine. It was made from cellulose treated with nitric acid and a solvent. The output of the process hardened into a hard, ivory-like material that could be molded when heated. It won a bronze medal at the 1862 World's Fair in London. Parkes, however, was unable to scale up the process to an industrial level, and products made from Parkesine quickly warped and cracked after a short period of use. An American printer and amateur inventor named John Wesley Hyatt took up where Parkes left off. Parkes had failed for lack of a proper softener, but Hyatt discovered that camphor would do the job very nicely. Hyatt was something of an industrial genius who understood what could be done with such a shapeable (or "plastic") material. He proceeded to design much of the basic industrial machinery needed to produce good-quality plastic materials in quantity. Since cellulose was the main constituent in the synthesis of this new material, Hyatt named it "celluloid." It was introduced in 1863. Among the first products from celluloid were dental pieces. Sets of false teeth built around celluloid proved cheaper than existing rubber dentures. Celluloid dentures, however, tended to soften when hot—making tea drinking difficult—and the camphor taste tended to be difficult to suppress. Celluloid's real breakthrough products were waterproof shirt collars, cuffs, and the false shirtfronts known as "dickies," whose unmanageable nature later became a stock joke in silent-movie comedies. They did not wilt and did not stain easily, and Hyatt sold them by trainloads. Celluloid proved extremely versatile in its field of application, providing a cheap and attractive replacement for ivory, tortoiseshell, and bone. Some of the items made with cellulose in the nineteenth century were beautifully designed and implemented. For example, celluloid combs made to tie up long tresses of hair became fashionable and are now jewel-like museum pieces. Such pretty trinkets were no longer only for the rich. The usefulness of celluloid was discovered for entirely new applications as well. Hyatt figured out how to fabricate the material in a strip format for movie film. By the year 1900, movie film was a major market for celluloid. The material, however, tended to yellow and crack over time. It also had another, more dangerous defect: it burned easily and spectacularly, which is unsurprising, given that mixtures of nitric acid and cellulose are also used to synthesize smokeless powder. Ping-pong balls, among the few products still made with celluloid, sizzle and burn if set on fire, and Hyatt liked to tell stories about celluloid billiard balls exploding when struck very hard. In 1884, a French chemist, the Comte de Chardonnay, introduced a cellulose-based fabric that became known as "Chardonnay silk." It was an attractive cloth, but like celluloid it was very flammable—a property completely unacceptable in clothing. After some ghastly accidents, Chardonnay silk was taken off the market. In 1894, three British inventors—Charles Cross, Edward Bevan, and Clayton Beadle—patented a new "artificial silk" or "art silk" that was much safer. The three men sold the rights for the new fabric to the French Courtauld Company, a major manufacturer of silk, which put it into production in 1905, using cellulose from wood pulp as the "feedstock" material. Art silk became well known under the trade name "rayon" and was produced in great quantities through the 1930s, when it was supplanted by better artificial fabrics. It remains in production today, often in blends with other natural and artificial fibers. It is cheap and feels smooth on the skin, though it is weak when wet and creases easily. It could also be produced in a transparent sheet form known as "cellophane." The limitations of celluloid led to the next major advance known as "phenolic" or "phenol-formaldehyde" plastics. Leo Hendrik Baekeland, a Belgian-born American living in New York state, was a chemist searching for insulating shellac to coat wires in electric motors and generators. Baekeland found that mixtures of phenol (C6H5OH) and formaldehyde (HCOH) formed a sticky mass when mixed together and heated, and the mass became extremely hard if allowed to cool and dry. He continued his investigations and found that the material could be mixed with wood flour, asbestos, or slate dust to create "composite" materials with different properties. Most of these composites were strong and fire resistant. The only problem was that the material tended to foam during synthesis, and the resulting product was of unacceptable quality. Baekeland built pressure vessels to force out the bubbles and provide a smooth, uniform product. He publicly announced his discovery in 1909, naming it "Bakelite." It was originally used for electrical and mechanical parts, finally coming into widespread use in consumer goods in the 1920s. When the Bakelite patent expired in 1927, the Catalin Corporation acquired the patent and began manufacturing Catalin plastic using a different process that allowed a wider range of coloring. Bakelite was the first true plastic. It was a purely synthetic material, not based on any material found in nature. It was also the first "thermoset" plastic. Conventional "thermoplastics" can be molded and then melted again, but thermoset plastics form bonds between polymers strands when "cured," creating a tangled matrix that cannot be undone without destroying the plastic. Thermoset plastics are tough and temperature resistant. Cheaper, less brittle plastics have largely replaced phenolic plastics, but they are still used in applications requiring its insulating and heat-resistant properties. For example, some electronic circuit boards are made of sheets of paper or cloth impregnated with phenolic resin. Phenolic sheets, rods, and tubes are produced in a wide variety of grades under various brand names. After the First World War, improvements in chemical technology led to an explosion of new forms of plastics. Among the earliest examples in the wave of new plastics were "polystyrene" (PS) and "polyvinyl chloride" (PVC), developed by IG Farben of Germany. Polystyrene is a rigid, brittle plastic that is now used to make plastic model kits, disposable eating utensils, and similar knickknacks. It is also the basis for one of the most popular "foamed" plastics, under the name "styrene foam" or "Styrofoam." Foam plastics can be synthesized in an "open cell" form, in which the foam bubbles are interconnected, as in an absorbent sponge; or a "closed cell" form, in which the bubbles are isolated from one another, as in gas-filled foam insulation and flotation devices. PVC has side chains incorporating chlorine atoms, which form strong bonds. PVC in its normal form is stiff, strong, and heat- and weather-resistant. It is now used for making plumbing supplies, gutters, house siding, enclosures for computers, and other electronics gear. PVC can also be softened by chemical processing, and in this form it is used for shrink-wrap, food packaging, and raingear. The real star of the plastics industry in the 1930s was "polyamide" (PA), far better known by its trade name, "nylon." It was the first purely synthetic fiber, introduced by DuPont Corporation at the 1939 World's Fair in New York City. In 1927, DuPont had begun a secret development project designated "Fiber66," under its chemistry department director E.K. Bolton and Harvard chemist Wallace Carothers. Carothers had been hired to perform pure research, and not only investigated new materials but also worked to understand their molecular structure and how it related to material properties. He took some of the first steps on the road to the "molecular design" of materials. His work led to the discovery of synthetic nylon fiber, which was very strong but also very flexible. The first application was for bristles for toothbrushes. DuPont's real target, however, was silk, particularly silk stockings. It took DuPont 12 years and 27 million U.S. dollars to refine nylon and develop the industrial processes for bulk manufacture. With such a major investment, it was no surprise that DuPont spared little expense to promote nylon after its introduction, creating a public sensation, or "nylon mania." Nylon mania abruptly ended around the close of 1941, when the United States entered World War II. The capacity to produce nylon stockings was shifted over to the manufacture of huge numbers of parachutes for fliers and paratroopers. After the war ended, DuPont went back to selling nylon to the public, engaging in another promotional campaign in 1946 that resulted in an even bigger craze, triggering "nylon riots." Nylon continues to be an important plastic, and not just for fabrics. In its bulk form, it is wear resistant, and so is used to build mechanical parts such as gears, bearings, and bushings. Another plastic that was critical to the war effort was "synthetic rubber," which was produced in a variety of forms. The first synthetic rubber polymer was obtained by Russian scientist Sergei Lebedev in 1910. Practical synthetic rubber grew out of studies published in 1930, reported independently by three scientists—Wallace Carothers, Sergei Lebedev, and Hermann Staudinger. In 1931, these studies led to one of the first successful synthetic rubbers, known as "neoprene," which was developed at DuPont under the direction of E.K. Bolton. Neoprene is highly resistant to heat and chemicals such as oil and gasoline, and is used in fuel hoses and as an insulating material in machinery. In 1935, German chemists synthesized the first of a series of synthetic rubbers known as "Buna rubbers." These were classified as "copolymers," meaning that their polymers were made up from two types of monomers, in alternating sequence. One such Buna rubber, known as "GR-S" ("Government Rubber Styrene," a copolymer of butadiene and styrene), became the basis for U.S. synthetic rubber production during World War II. During the war, the worldwide supplies of natural rubber were limited, and by mid-1942, most of the rubber-producing regions were under Japanese control. Military trucks needed rubber for tires, and rubber was used in almost every other war machine. The U.S. government launched a major (and largely secret) effort to develop and refine synthetic rubber. A principal scientist involved with the effort was Edward Robbins. By 1944, a total of 50 factories were manufacturing it, pouring out a volume of the material twice that of the world's natural rubber production before the beginning of the war. Synthetic rubber also played an important part in the space race and nuclear arms race. Solid rockets used during World War II used nitrocellulose explosives for propellants, but it was impractical and dangerous to make such rockets very big. Researchers at the California Institute of Technology (Caltech) began experimenting with solid fuels, including the use of synthetic rubbers in the fuel mixture. By the mid-1950s, large missiles were being built using solid fuels based on synthetic rubber, mixed with ammonium perchlorate and high proportions of aluminum powder. Such solid fuels could be cast into large, uniform blocks that had no cracks or other defects that would cause non-uniform burning. Ultimately, all large military rockets and missiles began using synthetic, rubber-based solid fuels, and they would also play a significant part in the civilian space effort. Additional plastics emerged in the pre-World War II period, though some did not come into widespread use until after the war. By 1936, American, British, and German companies were producing polymethyl methacrylate (PMMA), better known as "acrylic." Acrylics are now well known for their use in paints and synthetic fibers, such as fake furs. In their bulk form, however, they are extremely hard and more transparent than glass, and they are sold as glass replacements under trade names such as "Plexiglas" and "Lucite." Plexiglas was used to build aircraft canopies during the war, and it is currently also used as a marble replacement for countertops. Another important plastic, "polyethylene" (PE, sometimes known as "polythene"), was discovered in 1933 by Reginald Gibson and Eric Fawcett at the British industrial giant, Imperial Chemical Industries (ICI). This material evolved into two forms: "low density polyethylene" (LDPE) and "high density polyethylene" (HDPE). 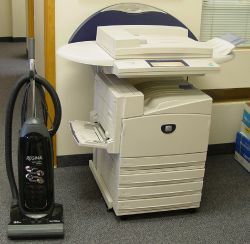 PEs are cheap, flexible, durable, and chemically resistant. LDPE is used to make films and packaging materials, while HDPE is used for containers, plumbing, and automotive fittings. While PE has low resistance to chemical attack, it was later discovered that a PE container could be made much more robust by exposing it to fluorine gas, which modified the surface layer of the container into the much tougher "polyfluoroethylene." Polypropylene lid of a Tic Tacs box, with a "living hinge" and the resin identification code under its flap. After the war, polyethylene led to an improved material, "polypropylene" (PP), which was discovered in the early 1950s by Giulio Natta. It is common in modern science and technology that the growth of the general body of knowledge can lead to the same inventions in different places at about the same time, but polypropylene was an extreme case of this phenomenon, being separately invented about nine times. It was a patent attorney's dream scenario, and litigation was not resolved until 1989. Polypropylene managed to survive the legal process, and two American chemists working for Phillips Petroleum—J. Paul Hogan and Robert Banks—are now generally credited as the "official" inventors of the material. Polypropylene is similar to its ancestor, polyethylene, and shares polyethylene's low cost, but it is much more robust. It is used for numerous things, from plastic bottles to carpets to plastic furniture to automobiles. Polyurethane was invented by Friedrich Bayer & Company in 1937. After the war, it came into use (in blown form) for mattresses, furniture padding, and thermal insulation. It is also one of the components (in non-blown form) of the fiber spandex. In 1939, IG Farben filed a patent for "polyepoxide" or "epoxy." Epoxies are a class of thermoset plastic that form cross-links and "cure" when a catalyzing agent, or "hardener," is added. After the war, they became widely used for coatings, "adhesives," and composite materials. Composites using epoxy as a matrix include glass-reinforced plastic, where the structural element is glass fiber, and "carbon-epoxy composites," in which the structural element is carbon fiber. Fiberglass is now often used to build sport boats, and carbon-epoxy composites are an increasingly important structural element in aircraft, as they are lightweight, strong, and heat resistant. In 1941, two chemists—Rex Whinfield and James Dickson—working at a small company named Calico Printer's Association in Manchester, England, developed "polyethylene terephthalate" (PET or PETE). It came to be used for synthetic fibers in the postwar era, with names such as "polyester," "dacron," and "terylene." PET is less permeable than other low-cost plastics and so is useful for making bottles for carbonated drinks (because carbonation tends to attack other plastics) and acidic drinks such as fruit or vegetable juices. PET is also strong and abrasion resistant, and is used for making mechanical parts, food trays, and other items that have to endure abuse. PET films are used as a base for recording tape. One of the most impressive plastics used in the war, and guarded as a top secret, was "polytetrafluoroethylene" (PTFE), better known as "Teflon," which could be deposited on metal surfaces as a scratchproof, corrosion-resistant coating. The polyfluoroethylene surface layer created by exposing a polyethylene container to fluorine gas is very similar to Teflon. Roy Plunkett, a DuPont chemist, discovered Teflon by accident in 1938. During the war, it was used in the gaseous-diffusion process to refine uranium for atomic bomb production, as the process was highly corrosive. By the early 1960s, Teflon "nonstick" frying pans were a hot item. Teflon was later used to synthesize the breathable fabric "Gore-Tex," which can be used to build raingear that "breathes" to keep the wearer's moisture from building up. GoreTex is also used for surgical implants, and Teflon strands are used to make dental floss. During warfare, Teflon mixed with fluorine compounds is used to make "decoy" flares dropped by aircraft to distract heat-seeking missiles. After the war, the new plastics that had been developed entered the consumer mainstream in a flood. New manufacturing processes were developed to churn out plastic products in vast quantities. American consumers enthusiastically adopted the endless range of colorful, cheap, and durable plastic gimmicks being produced for new suburban home life. One of the most visible parts of this plastics invasion was Earl Tupper's "Tupperware," a complete line of sealable polyethylene food containers that Tupper cleverly promoted through a network of housewives who sold Tupperware as a means of bringing in some money. The Tupperware line of products was well thought out and highly effective, greatly reducing spoilage of foods in storage. Thin-film plastic wrap that could be purchased in rolls also helped keep food fresh. Another prominent material in 1950s homes was "Formica®," a durable and attractive plastic laminate that was used to surface furniture and cabinetry. It was particularly useful in kitchens as a nonabsorbent material that could be easily cleaned of food stains and grease. An attractive, well-built table could be constructed using low-cost and lightweight plywood with Formica covering, rather than expensive, heavy hardwoods like oak or mahogany. Plastics continue to be improved. General Electric introduced "lexan," a high-impact "polycarbonate" plastic, in the 1970s. DuPont developed "Kevlar," an extremely strong synthetic fiber that was best known for its use in bulletproof vests and combat helmets. Kevlar was so remarkable that DuPont officials actually had to release statements to deny rumors that the company had received the recipe for it from space aliens. Even large trash containers are made from plastic. Although plastics have had a remarkable impact globally, it has become increasingly obvious that there is a price to be paid for their use. They are durable and degrade very slowly. In some cases, burning plastic can release toxic fumes. Also, the manufacture of plastics often creates large quantities of chemical pollutants and requires use of the Earth's limited supply of fossil fuels. It should be noted, however, that plastics consume only 4 percent of the world's oil production. Furthermore, it may be argued that the use of plastics helps the environment by saving water and oil. For example, plastics make cars lighter, thus saving oil and reducing carbon dioxide emissions. By the 1990s, plastic recycling programs became common in the United States and elsewhere. Thermoplastics can be remelted and reused, and thermoset plastics can be ground up and used as filler, though the purity of the material tends to degrade with each reuse cycle. There are methods by which plastics can be broken back down to a feedstock state. 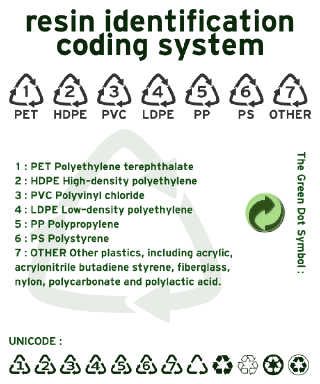 PETE: Polyethylene Terephthalate - Commonly found on: 2-liter soft drink bottles, cooking oil bottles, peanut butter jars. HDPE: High Density Polyethylene - Commonly found on: detergent bottles, milk jugs. PVC: Polyvinyl Chloride - Commonly found on: plastic pipes, outdoor furniture, shrink-wrap, water bottles, salad dressing and liquid detergent containers. LDPE: Low Density Polyethylene - Commonly found on: dry-cleaning bags, produce bags, trashcan liners, food storage containers. PP: Polypropylene - Commonly found on: bottle caps, drinking straws. PS: Polystyrene - Commonly found on: packaging pellets or "Styrofoam peanuts," cups, plastic tableware, meat trays, take-away food clamshell containers. OTHER: This plastic category, as its name implies, is any plastic other than those named in #1–#6 above. Commonly found on: certain kinds of food containers and Tupperware. Unfortunately, recycling plastics has proven difficult. The biggest problem with plastics recycling is that the sorting of plastic waste is difficult and labor intensive. Typically, workers sort the plastic by looking at the resin identification code, though common containers like soda bottles can be sorted from memory. Other recyclable materials, such as metals, are easier to process mechanically. While containers are usually made from a single type and color of plastic, making them relatively easy to sort out, a consumer product like a cellular phone may have many small parts consisting of over a dozen different types and colors of plastics. In a case like this, the resources it would take to separate the plastics far exceed their value, though complex items made of many types of plastics are not disposed of frequently. Recycling certain types of plastics can be unprofitable as well. For example, polystyrene is rarely recycled because it is usually not cost effective. These unrecyclable wastes can be disposed of in landfills, incinerated, or used to produce electricity at waste-to-energy plants. Currently, the percentage of plastics recycled in the United States is very small—somewhere around 5 percent. The American Plastics Council spends about 20 million U.S. dollars per year on advertising campaigns that attempt to convince more members of the public to recycle. Research has been done on biodegradable plastics that break down with exposure to sunlight. Starch can be mixed with plastic to allow it to degrade more easily, but it still does not lead to complete breakdown of the plastic. Some researchers have genetically engineered bacteria that synthesize a completely biodegradable plastic, but this material is expensive at present. The company BASF makes Ecoflex, a fully biodegradable polyester, for food packaging applications. The disadvantage of biodegradable plastics is that the carbon that is locked up in them is released into the atmosphere as the greenhouse gas carbon dioxide when they degrade. If they are made from organic material, however, there is no net gain in emissions. So far, these plastics have proven too costly and limited for general use, and critics have pointed out that the only real problem they address is roadside litter, which is regarded as a secondary issue. When such plastic materials are dumped into landfills, they can become "mummified" and persist for decades even if they are intended to be biodegradable. In this regard, though, plastics are no worse than paper, which also degrades very slowly in landfills. There have been some success stories. The Courtauld concern, the original producer of rayon, came up with a revised process for the material in the mid-1980s to produce "Tencel." Possessing many properties superior to those of rayon, it is produced from "biomass" feedstocks, and the manufacturing process is extraordinarily clean by the standards of plastics production. One of the most appealing features of plastics has been their low price compared to other materials. In recent years, however, the cost of plastics has been rising dramatically. The cause of the increase is the sharply rising cost of petroleum, the raw material that is chemically altered to form commercial plastics. In 2004, the higher price of plastic drove a number of plastic-toy manufacturers out of business. Fears of dwindling petroleum supplies are becoming very real, with publications such as USA Today reporting that current oil reserves will last only 40 years. Reserves of alternatives such as oil shale and tar oil (tar sand) do exist, but the cost of production is much higher than by using current sources. Scientists are currently seeking cheaper alternatives to plastic. Some alternatives being considered are: graphite, fiberglass, carbon fiber, graphene, carbon nanotubes, diamond, aerogel, carbon nanofoam, cellulose soybean plastic (bioplastic), and other carbon-based, non-petroleum materials. Some of these alternatives are too expensive or not malleable enough, but they can be used in specific applications. Some are many times stronger than plastic but crack if made thin like cellophane. The most promising alternatives to plastic are graphene, carbon nanotube, and carbon nanofoam. All three of these are made of nanocarbons, products of the new nanotechnology. Nanocarbons are very cheap, 100 times stronger than steel, slicker than Teflon, and lightweight. They can be made very thin, made to stretch, and built into any shape—all the things plastics can do. Already, bowling balls, golf balls, sports equipment, and waterproof cotton balls have been made of nanocarbons. a biodegradable, thermoplastic, aliphatic polyester derived from lactic acid which in turn can be made by fermentation of various agricultural products such as corn starch. J. Harry Dubois Collection on the History of Plastics, ca. 1900-1975 Archives Center, National Museum of American History, Smithsonian Institution. Retrieved March 14, 2017.